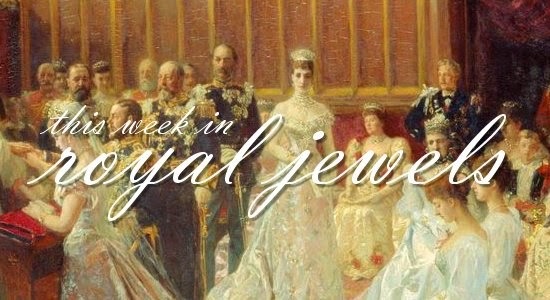 Here are some of the sparkliest royal jewel appearances and stories of the week! 9. Faberge's imperial eggs have been in the news a great deal recently. To mark the Easter holiday, the bloggers at Luxarazzi treated us to a glimpse of the egg owned by Liechtenstein: the Apple Blossom Egg, made in St. Petersburg in 1901. 8. On Easter Sunday in Palma de Mallorca, Queen Sofia of Spain piled on the jewelry. One of her selections was especially appropriate for the day: a necklace of colorful Easter eggs. 7. In Rotterdam, Queen Maxima sported yet another pair of whimsical, oversized earrings, this time for a visit to the Erasmus Medical Center. 6. For her outing to church on Easter, Queen Elizabeth II chose a familiar brooch: the aquamarine clips by Cartier, a birthday gift from her parents in 1944. 5. 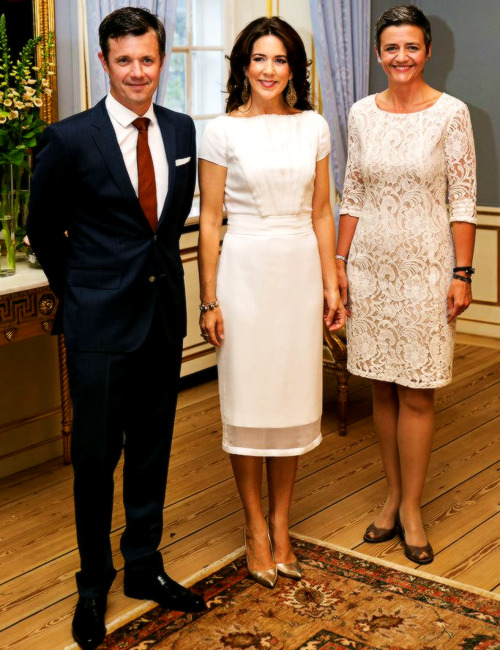 Crown Princess Victoria wears a number of pieces of jewelry while showing off the interiors of Haga Palace (and the antics of Princess Estelle) in a new SVT documentary that debuted on Monday, available to stream globally now at this link. 4. Empress Michiko demonstrated her usual approach of understated elegance where jewels are concerned while welcoming President Obama to Japan on Thursday. 2. At a visit to the Australian War Memorial on ANZAC Day, the Duchess of Cambridge wore a brightly colored poppy brooch, a symbol of remembrance for those fallen in World War I. 1. It's almost as if she read the blog this week: our Magpie of the Month, Queen Margrethe II of Denmark, wore her modern turquoise and gold jewelry at the start of a state visit to China on Thursday.